The terror birds were six-foot-tall, flightless birds with massive heads and large beaks in the family of birds know as Phorusrhacidae. They roamed in South America from 62 to about 2 million years ago. It appears that during the Great American Biotic Interchange when the Isthmus of Panama closed and joined the two continents terror birds made their way to North America. 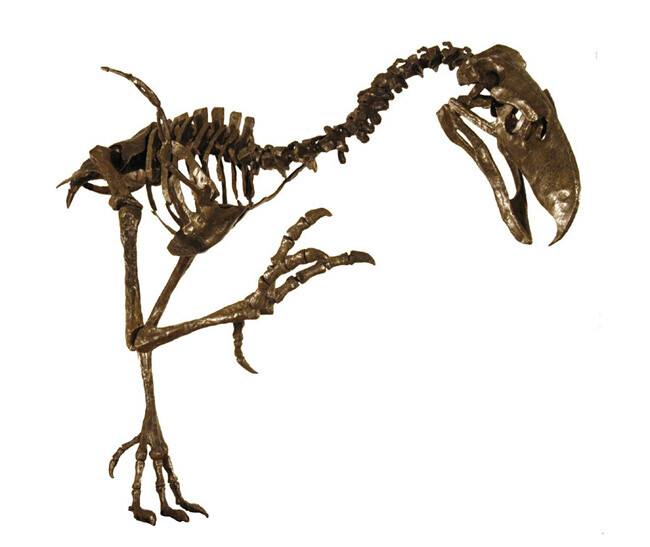 Terror bird specimens from a genus identified as Titanis walleri have been found only in the Gulf coast areas of Florida and Texas. Now California can be added to their territory. The beak is part of the collection of fossils found in the Anza-Borrego Desert State Park and housed in Colorado Desert District Stout Research Center. In 1972 paleontologist Hildegard Howard assigned the beak to Teratornithidae, a family of large condor-like birds. 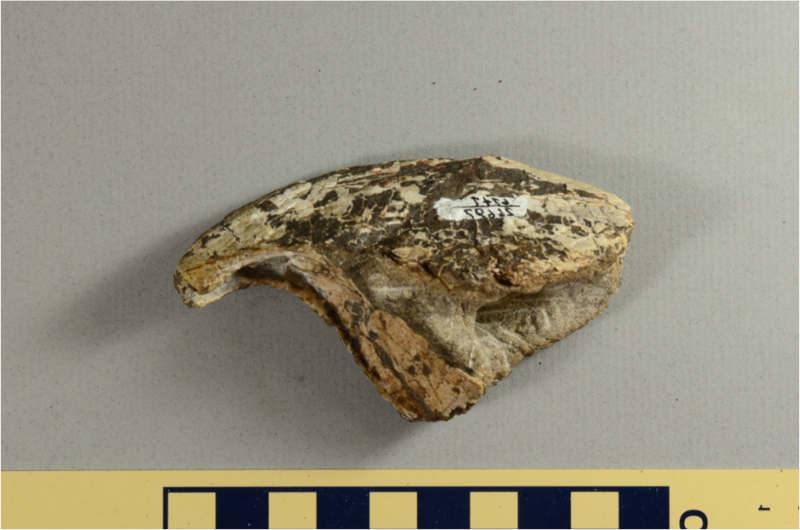 Since 2004 the beak was on loan to bird paleontologist Robert M. Chandler from Georgia College in Milledgeville, Ga., who has worked with the Gulf coast Titanis specimens. 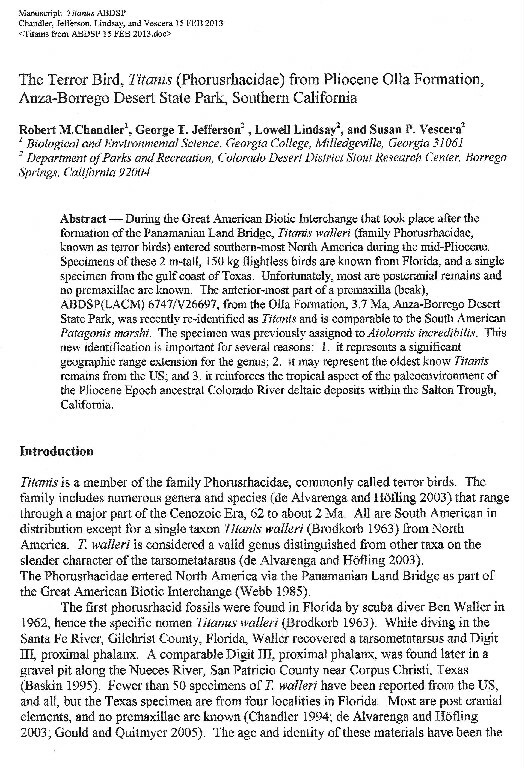 From his examination of the Anza-Borrego beak he concluded the beak was that of a phorusrhacid. Since Titanis is the only genus of that family known in North America, Chandler has called it a Titanis beak. In 2012 Chandler communicated his findings to George T. Jefferson, District Paleontologist Emeritus at the Stout Research Center. The beak’s new identification and its implications are the subjects of a scientific paper delivered at the 27th Annual Desert Symposium held at the California State University’s Desert Studies Center in Zzyzx, California. The paper was written by George T. Jefferson and co-authored by Robert M. Chandler, Lowell Lindsay, desert naturalist, author and CEO of Sunbelt Publications, and Susan Vescera, volunteer paleontologist at the Stout Center. The paper makes several conclusions. 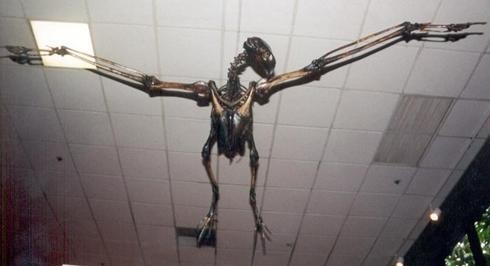 Placing Titanis in California represents a significant extension of its habitat range; in addition, dated at 3.7 million years old, the beak may be the oldest Titanis specimen in the United States; and the presence of the terror bird supports the idea that during the Pliocene Epoch the paleoenvironment of this area was tropical. 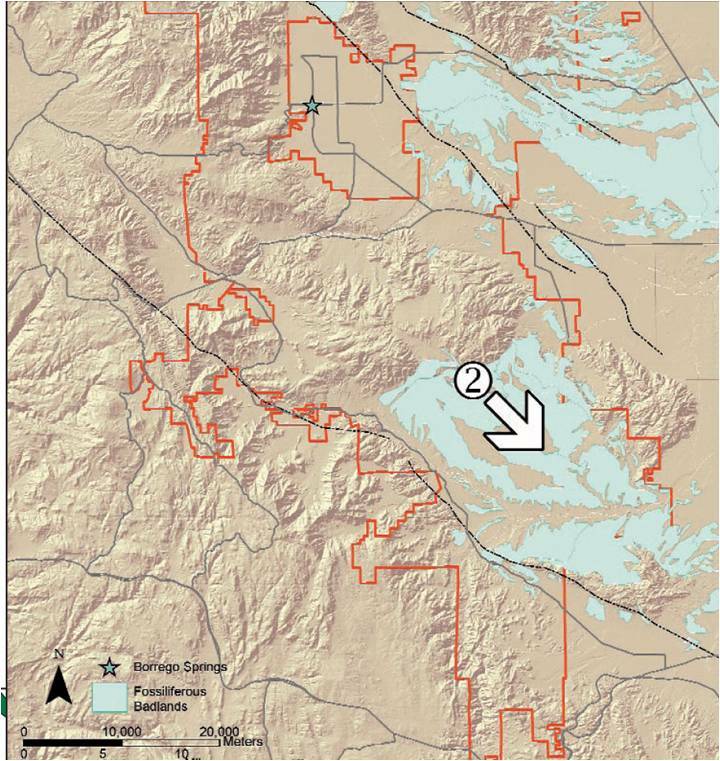 The newly discovered recognition of terror birds in the Borrego Spring environs was the subject of one of the presentations at the Anza-Borrego Desert State Park Paleontology Society at the annual Open House in October 2012.